There are two activity sheets in this purchase. 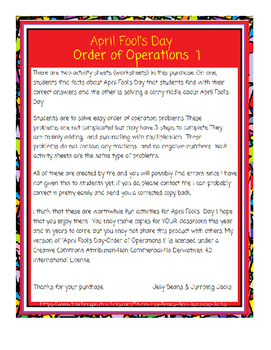 On one, students find facts about April Fool's Day. 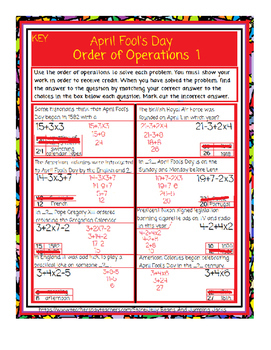 With this sheet, students will find the correct answer to answer questions about April Fool's Day. The other activity is solving a corny riddle about April Fool's Day. Students are to solve EASY order of operation problems. These problems are not complicated but may have 3 steps to complete. They are mainly adding and subtracting with multiplication. These problems do not contain any fractions and no negative numbers. Both activity sheets are the same type of problems. All of these are created by me and you will possibly find errors. If you do, please contact me. I will correct the mistake(s) and you can download a corrected copy. I think that these are worthwhile fun activities for April Fools' Day. I hope that you enjoy them. You may make copies for YOUR classroom this year and in years to come, but you may not share this product with others. 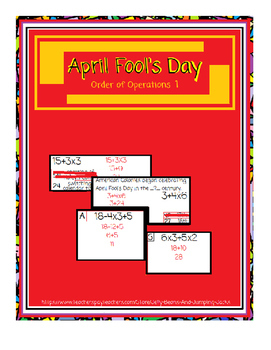 My version of "April Fool's Day-Order of Operations 1" is licensed under a Creative Commons Attribution-Non Commercial-No Derivatives 4.0 International License.